As I write this Google's Gmail is down and millions ,somewhere around 113 million users, have no access to their email and the only information coming from Google is "We're aware of a problem with Gmail affecting a small subset of users. Chris M had already blogged about how Twitter had helped him out while he was Gmail-less. So to keep up with the developments I turned to Twitter, a 'micro-blogging' platform I use sporadically when I am bored (ironically notoriuos for the amount of downtime experienced by it's users). The problem I now had though, was that I purposefully keep the number of people I follow to a minimum so how was I going to keep up with developments being tweeted by the thousands of Twitter-ers? Enter Tweetdeck. A utility I have known about for some time, checked out more than once but never gotten the impetus to install. 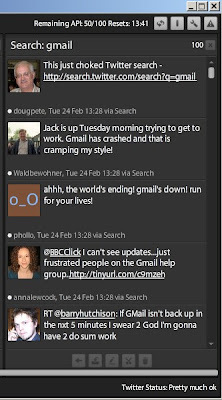 It took a quick Adobe Air install and a quicker application installation and voila Tweetdeck was up and running. But how does this help? Tweetdeck allows you to initiate a phrase search, this appears in a separate column in the application and then updates this column as new tweets that match the search appear. This is not limited to those you follow! So now I sit back and watch 10 sec updates of the worldwide confusion, frustration and anger as they come to terms with the potential pitfalls of keeping your emails in the cloud! When I was able to easily book a table for Saturday night (14th February) at a well-known Constantia restuarant, it struck me that there must be many men (and ladies) who have not decided/bothered or thought of how they intend to spoil their special other this Valentine's Day. If the middle reason resonated with you then I suggest you may need to go all out. Might I suggest over-nighting at Zorgvliet Spa? My wife and myself were treated to a weekend at Stellenbosch's Zorgvliet Spa last year and it will remain stand-out special experience. 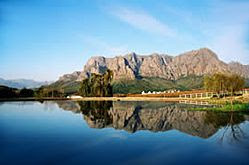 Zorgvliet is situated in the vineyards of Western Cape's winelands. Sure the suites are spacious and luxurious, each reportedly with it's own fireplace, superfluous for this time of the year but appreciated when we visited in the middle of winter and the views fantastic, but for me it was the a combination of the small gestures and the outstanding service that made the stay a special one. Being a small all-suite establishment we expected and received personal treatment from the helpful staff. There were little touches, a bottle of red from vineyards we overlooked, the customary chocolates each evening, chocolate fondue laid on our last night, the obligatory white gown and slippers that become your a part of your permanent attire for your stay, and did I mention this is a spa? Treat yourself to a, uh, treatment and you can be guaranteed to leave feeling special and relaxed. Trust me this is a top-tip, a gift that is sure to score you some points with your lady/man and you get some personal pampering thrown into the deal. It's a win-win!